Neighborhoods now have the opportunity to offset the cost of their website by selling the sponsorship position on their public sign in page. 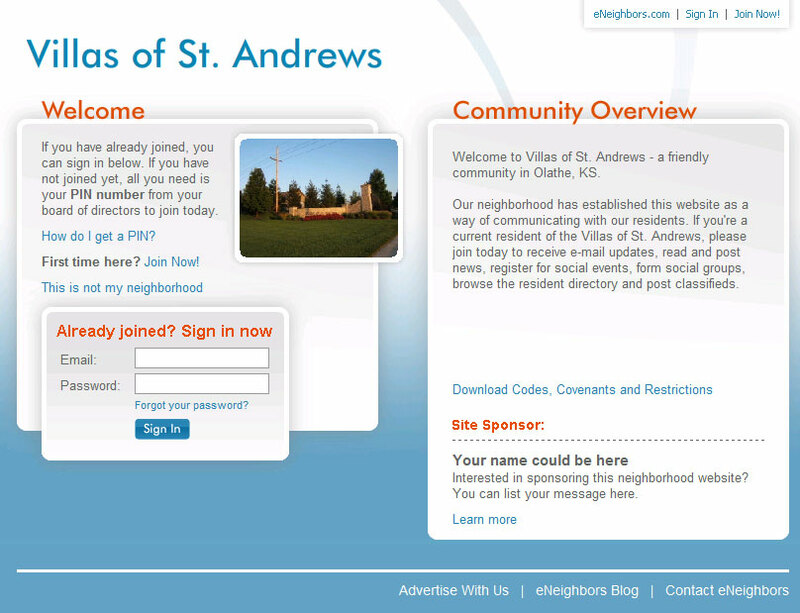 For those neighborhoods that do not currently have a sponsor listed on your homepage, you may begin selling your space immediately. For those that currently have a sponsor listed, you will have to wait until the end of that sponsor’s current agreement before you can sell the position. 1. Display advertising (i.e., print ads) in the local newspaper is still the best ad/marketing vehicle for a small business to reach its audience. I’m fairly certain the numbers used by J.P. Morgan’s analysts include classified ad revenue. Classifieds have been decimated in local ad spend, but display ads in local newspapers are probably just as strong as they have ever been, despite shrinking circulation. This is mainly because there are no alternatives for local businesses, including local affiliates of national brands (e.g., local auto dealers, quick-service restaurant franchises, national retailer locations, etc. ), to reach their local audiences. Much of this has to do with creative production and the lack of online inventory that can be targeted locally. 2. Online audience targeting is still not good enough for small businesses to shift their ad dollars online. Local newspaper ad spend on display ads is very unlikely to move online for the next few years. The reason is similar to why television didn’t drop for some time despite shrinking audiences. There just isn’t an alternative to reach the target audience that a small local business, even a local affiliate of a national brand, can take advantage of. 3. Still no infrastructure for small businesses to get “true” local service positioning. Local search has mainly solidified around mapping, which is great at taking advantage of people searching for a product in a local area but not for driving awareness of a sale or trying to create demand. And without a sales force and creative production resources to serve the local markets, it’s highly unlikely that much of the local inventory available within the online space will ever get sold to local businesses. The infrastructure is really set up for supporting national advertisers with localized creative. Some interesting data over on eMarketer today talking about e-mail advertising and the expected growth in spending from $1.2 billion in 2007 to $2 billion in 2012. Additionally, JupiterResearch indicates that about one fourth of all email is now opt-in. What I find interesting is some of the feedback from users about why they decide to no longer opt in to emails from certain companies. One of the primary reasons was that the content was no longer relevant. Is there an echo in here? This is great news for us here at eNeighbors since the primary traffic driver of our service is the automated e-mail newsletters of weekly content from your neighborhood site (it’s like Facebook’s news feed without all the crap). The content in these newsletters can’t be more relevant since it’s an aggregated conversation from your neighbors about things that are happening literally on your street. We recognize that while most people want to stay informed about their local happenings (especially in their own neighborhood) there are only so many hours in the day. We’ve seen that the weekly recap of info is a great way to keep up on what’s going on. And that’s why we are working on some new features and enhancements to the eNewsletters. Stay tuned. How much do you buy online? Depending on your social situation (single, married, kids, etc. ), the amount of actual online purchasing can vary greatly. But how often do you research a purchase online regardless of whether you are planning to purchase online or offline? When it comes to local search, Greg Sterling has some great comments on SEL today. Greg’s comment in his opening statement are of particular interest to me as it relates to eNeighbors. Since our target audience is homeowners in a managed community, the home services are a perfect fit for us to be able to recommend and advertise to our users, but Greg’s comment about products (which I assume to mean pretty much anything) tell me that every transaction whether on or offline starts at the local level since that’s where we all live. In other words, we all live in a local community no matter where we are. This local community which houses our friends and family is the largest influence on our buying habits. Our local habitat dictates our entertainment options, our habits, hobbies, etc. You get the idea. I think the real insight here is this — to sell a product (any product) how much more effective would that sales process be if it were approached from a local level? Obviously, it would be exponetially more effective. It would be like a door-to-door salesman for the entire world. In the past, this approach has not been very cost-effective for obvious reasons, but with the recent adoption of the web’s social networking features, this type of sales approach is now possible. So, once again I’m advocating the use of a bottom-up approach to local search. In this case, as it directly relates to local commerce. Ironically, the internet may be the vehicle to bring back the feeling of community and localness.